Having vehicle and personal travel insurances are really important and some even choose not to have one but honestly, accidents do happen and they also seem to happen when you least expect it & least need it. 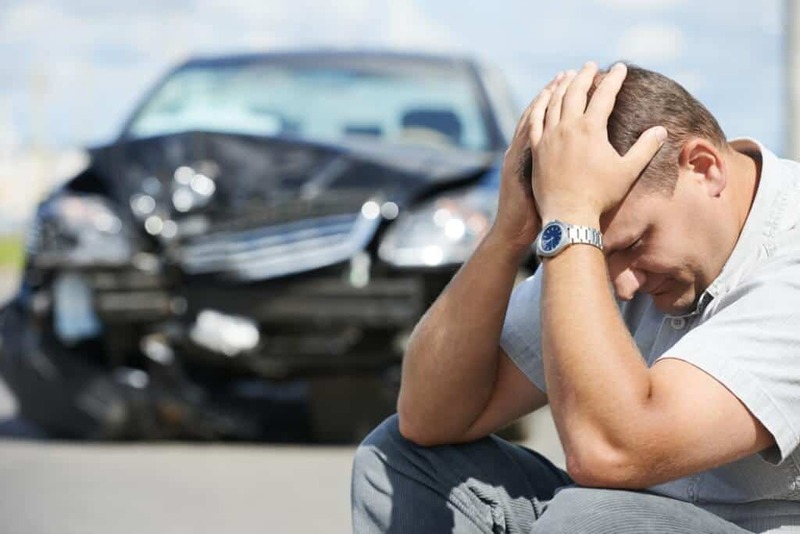 Medical, vehicle damages repair bills can cost a fortune abroad and by having personal and vehicle insurance coverage in Thailand, you can have a peace of mind. As a part of preparing for Malaysia – Thailand Border Crossing By Car Or Motorcycle, getting insurance coverage for vehicle is very important. For those who had been traveling in Thailand, knew how complicated it can be if one involved in an accident especially when you don’t have insurance coverage. In a Nutshell, you will need the following insurances for proper coverage whilst riding / driving in Thailand. Now, I’ll go into the details of the insurances type listed above. The Compulsory Motor Insurance (CMI) provides a certain amount of medical compensation (Usually up to THB 80K) for any person who encounters accidents from vehicles on the road in Thailand. Please note it is a legal requirement (Motor Vehicle Accident Victims Act 1992) in Thailand for vehicles to have Compulsory Motor Insurance (CMI). This CMI can be bought from the local Department of Land Transport Office (DLT), from insurance companies, and from some insurance agents near the borders (Just look for the Insurance signboard). It usually cost about RM 20 for 9 days. The Voluntary Insurance provides Thailand’s property / vehicle damages coverage due to an accident in Thailand and it is divided into three different classes. Only the class three is offered to foreign vehicle. Based on our findings, Asia Insurance in Thailand provides class three voluntary insurance for foreign vehicle. This Voluntary insurance can be bought at the Asia Insurance’s office / agents in Thailand and if you’re accessing Thailand from the south, they have agents in Hatyai, Betong, Dannok and also agents in Malaysia. Click here to view the coverage details, pricing and you will need to choose 3+ for Car and 3 Motorcycle for Motorcycle. Endorsement 101 provides extension of your Malaysian comprehensive insurance for use in Thailand. Below is the important section that highlights this endorsement and it is applicable for both motorcycle and car. 1. This endorsement 101 extension only covers vehicle damages and not bodily injury. 2. Extension is applicable to commercial vehicle passenger car and motorcycle only. 3. The limit of liability of RM100,000 would only be applicable to third party property damage claim. For Own Damage claim, the limit of liability of insurers would be in accordance with the Sum Insured of the Policy. This is an additional protection for yourself or your family / passenger if they are insured and it does not cover vehicle damages. I would recommend World Nomads Travel Insurance as they cover most of the country in the world, affordable, they have excellent customer support and good reviews online. You can use the widget below to get a quote for your travel insurance. Alternatively, you can contact Malaysian Travel insurance agency to buy one. I already have Endorsement 101 extension which covers both mine and third party vehicles in Thailand. Why do I need Thai Class Three Voluntary insurance? The 101 extension is good but it is not being fair to Thai vehicle as Thai people will need to use their own money first to repair their own vehicle and submit their claims to Malaysian Insurance company. The reimbursement process can take up to 6 months and trust me, no Thai people (Even me) will agree on this especially if the accident fault is on your side. Depending on the underwriter, having Thai Class Three Voluntary insurance usually covers them comprehensively, i.e. They don’t have to pay in advance for the repair work done on their vehicle as it will be handled by the Thai insurance company. Besides Asia Insurance, any other underwriters for Thai Class three Voluntary Insurance? Honestly, I’ve spent days trying to get in touch with Thai underwriters and most of them can’t speak English and not replying to my emails. I know they are other underwriters who also provides Class 3 Voluntary insurance but you just need to find them yourself. Asia Insurance just happens to be at Hatyai / Betong and I’ve managed to speak with their agents. Can I buy Thai Class three Voluntary Insurance only for my travel dates? Unfortunately, their offering is for a year and I know it does not make sense to purchase one if you’re just going to travel to Thailand for a few days. However, few Malaysian are trying to get in touch with Asia Insurance office in Bangkok and hopefully they will be able provide minimum period of coverage. i.e. 3 months etc. Which Malaysian underwriters (Insurance Company) provides extension 101 to Thailand? As far that I am aware, Allianz, AXA, AIG, Etiqa, Tokio Marine and I am sure they are many more. You will just need to call your underwriter to confirm on this. Active Malaysian comprehensive vehicle insurance with your insurance company and you will need to walk in to your insurance company’s office to get this coverage for your vehicle. I don’t have a comprehensive insurance, Can I still buy Endorsement 101 coverage? Sum insured for your Car or Motorcycle and the maximum of RM 100,000 for third party vehicle. What does the Endorsement 101 covers? Only damages to yours and third party vehicle. Which countries the Endorsement covers? Does the Endorsement 101 covers bodily injury? No, the endorsement 101 does not cover bodily injury. You will need to purchase personal travel insurance for bodily injury coverage and I would recommend World Nomads Travel Insurance. 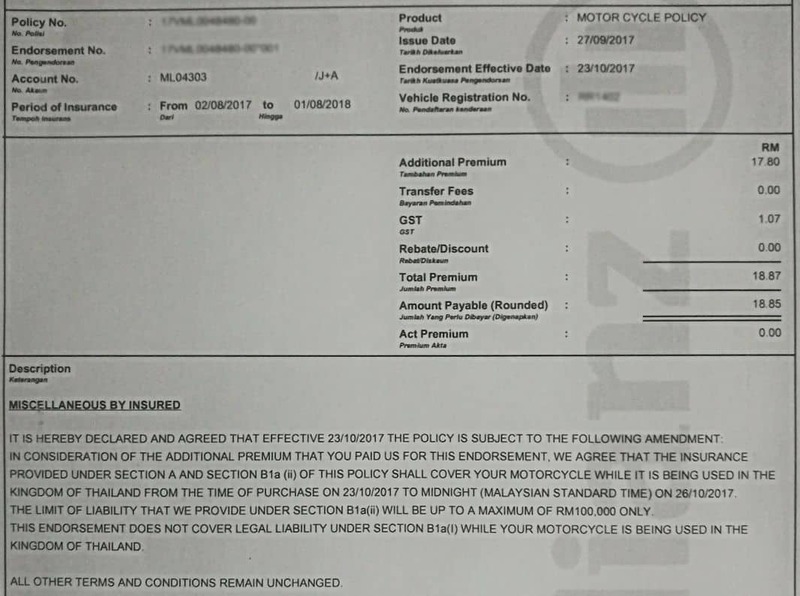 For my motorcycle, the comprehensive premium is RM949.19 (x) 15% (x) 12.5% = RM 17.80 + 6% GST = RM 18.85 is the amount I paid for 3 days coverage in Thailand. I’m involved in an accident, what should I do? If you have only taken Endorsement 101 extension; Call Thai Tourism Police as they speaks English by dialing 1155 using your local Thai Simcard and ask them to assist you in contacting Thailand Tourist assistance center (TAC) . You will also need to contact Malaysian Embassy / Consulate General in Thailand and with their advise, make a police report. Next, make a call to notify your Malaysian Insurance company, tow your vehicle to Malaysian border at your own cost and from Malaysia border, it will be borne by your Malaysian insurance company. Please note your vehicle repair work has to be done in Malaysia and for third party (Thai Vehicle), they will need to pay on their own first to repair their vehicle and send the claim to the insurance company in Malaysia. Third party claim process takes from 2-6 months. In most cases, Thai counterpart will demand cash payment from you for the repair work on their Vehicle. If you have taken both Endorsement 101 and Thai Voluntary Insurance; Follow the steps above and tow your vehicle back to Malaysia border and call your underwriter. For Thai Vehicle repair work, call your Voluntary Thai Insurance company for further action. If you haven’t taken any insurances; Get ready to bear the high cost of vehicle repairs work etc. Any other questions on Endorsement 101 extension, please read HERE. 4. Thailand Tourist Police who speaks English by dialing 1155 from your local Thai simcard number. Disclaimer: Please note all the information are gathered via phone calls, meetings with underwriters and if there are any discrepancies, please contact your underwriter for further clarification. I am not responsible for any views or information provided that may be incorrect or erroneous. If you have any questions or suggestions, drop them at the comment box below and feel free to share this article via the social buttons.